I can’t sleep. You would think that running all day would give me a sound night of sleep. Usually it does. But it is now 4:30 in the morning. Maybe I am a little nervous about the run today to Pendleton. It’s 46miles and except for one bend early on when the interstate turns south east from the Columbia, the road is dead straight. It’s not just the distance that scares me, it is the monotony. The high point (or ugly point?) will be running past the Umatilla Army Depot. It’s the huge brown spot on the map below where 82 and 84 intersect. So a big thanks for some of the texts, emails, comments, and fb messages I’ve received over the past few days. And seeing friends donate has been great. That said, I’ll spend some more time studying the map and hopefully find an earlier stopping point for the run today. Maybe Stanfield instead. No great adventures these past few days. My body is holding up ok. I have a lot of scratches on my legs, some itchy bites, some sun burn, and I lanced three blisters two days ago. Otherwise, just peachy. 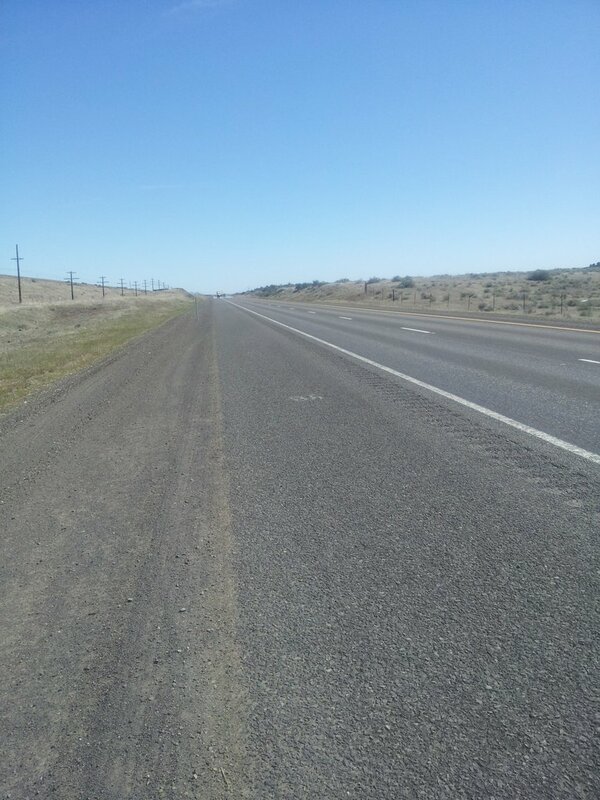 I managed to find some side roads to run on but those have petered out and the last two days have been straight forward running on the interstate. The shoulder is huge and the traffic is now pretty light. No more police pull overs. It’s been amazing to watch the landscape slowly change, now low hills surround me and I find bits of tumble weed caught up in fences. There are windmills everywhere. The mornings are still cold – in the 40’s – but by mid-day it is pushing 70 and I’m usually fatiguing. I wish I could say my head is filled with profound thoughts while I run, but that is not the case. Lately, I’ve been thinking a lot about Everest and all the teams that are now starting to go up the mountain for their acclimitazation climbs. I think it was a year ago today that I made my first trip to Camp I. My memory of reaching the top of the ice fall and seeing the Western Cwm was feeling that even if I never got to summit, the trip was worth it, the Western Cwm is probably one of the most beautiful places I can think of with gentle snow slopes up to the Lhotse face and side walls leading up the west ridge of Everest and Nuptse. I’m not even across Oregon, but with 10 days in and 280 miles I am starting to get a sense of what being a journey runner is; much like reaching Camp I gave me a sense of climbing Everest. I guess I’m trying to say that if I turn an ankle now and can’t climb/run further, I will be at peace. And since I am (somewhat still) on the topic: I wish all the teams on Everest safe journeys this season- especially Dorjee’s team. And I hope my friends at Everest ER have a lot of time on their hands. If anyone wants to follow this season on the mountain, I recommend subscribing to Alan Arnette’s blog. And if anyone wants to follow other people trying to cross the US on foot, I recommend John Wallace’s site: http://usacrossers.com/ (I’ll ask to be added if I reach Idaho and feel good about continuing to run). Doesn’t get much more straight. should be called Boredman, Or with a road that straight! enjoy the journey! Great to see this post Seth. I was thinking about you on this Boston Marathon Day. I wondered how you are sleeping and how you are showering, ect. Also thinking about how many calories you need to get into you and how you do that. Do you plan one night in a real bed every certain number of days? Amazing that one’s body can manage this. Keeping you in my best visage. This is Chris Johnson…you’re buddy from Chestnut Street!! Someone posted your journey on our High School Facebook page. I am amazed with what you are doing…You make Potsdam proud!! I saw Robin last year at a work event and she told me about all your adventures. I hope she told you I said hello. Please look me up next time you are in town, I would love to catch up. Good luck with everything and be safe!